Make sure all pages within each unique website have a common identifier. For example, if you have three distinct websites that serve different purposes, I like to assign a value in the page name for each website so I can easily filter those pages in a global report suite (one that has data from all websites). 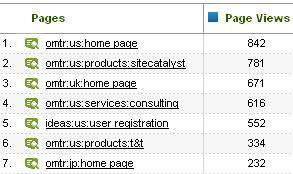 For example, for the Omniture website, I would have an identifer for the public (marketing) website (i.e. “omtr:”) and a different identifier for say the Idea Exchange (i.e. “ideas:”). I like to include the section in the page name when possible. 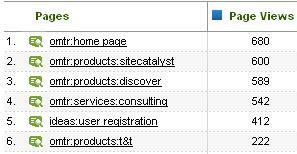 For example, if the Omniture public website has a section for “Products” and another for “Services,” I would include those in the page name (i.e. “omtr:products:” or “omtr:services”). This allows you to easily filter Page reports to get all of the pages within a section. Some companies also include the sub-section in the page name which is fine as long as you don’t hit the sProp character limit. Make sure all pages have a unique name. If you have two pages with the same exact page name, SiteCatalyst will treat them as a single page and all stats for that page will be merged (including paths). Be mindful of case-sensitivity. sProps are case-sensitive, so if you have the same pagename value, but in different cases, you will get two distinct page names. A common best practice is to force upper or lower case in the JS file to avoid any issues. One other item related to site locales is the use of different languages or translated pages. While I do recommend different page names for each site locale, I do not recommend that you have different page names for the same page translated into different languages. You can read more about this in my old Foreign Language post. After dealing with Page Names, the next thing I like to tackle is Site Sections. These are useful if you want to see how visitors are navigating your website at a higher level than pages. If you have good page names, you really should be able to build your Site Sections by setting it equal to the page name minus everything past the last “:” symbol. For example, in the example above, if the page name is “omtr:us:services:consulting” then the section would be “omtr:us:services” (you choose whether you want to include the “:” at the end or not). I have seen many clients that can set Site Section values automatically based upon good page names which saves a lot of development work and ensures consistency. One variable that many clients forget to include is the Site variable. Essentially, what you are doing here is to pass in a value for the website by itself into an sProp. In the example above, this would mean values of “omtr” or “ideas” by themselves in an sProp. Doing this allows you to see total Visits and Unique Visitors by site in one report and when Pathing is enabled, allows you to see how people are navigating from one website to another. Again, if you have good page names, you can set the Site variable by simply grabbing everything before the first “:” symbol in the page name. Those of you who have read my previous blog posts know that I am a fan of setting a Page Type on each page that represents the function of the page. I won’t rehash this topic, but recommend you check out my prior post on this. Great tips. A couple other things to remember is the Pages report is capped at 500K unique values, so if you have a very large site then you could easily exceed that amount. Also if you have a site that contains some kind of search functionality, you may end up naming your search results page something simple like “Search Results”. One thing to remember is you should change the name of the page for pagination for the sake of pathing. Pathing reports see pages with the same page name as a refresh and would not accurately tell you that your visitor has gone 5 results pages deep before viewing a product. In this case I would suggest adding the page number to the page name, something like s.pageName=”Search Results | 1″. thanks for the tip on search results pages kevin, i need to implement that. another good practice is to make sure your code has a last resort default setting for all of your content variables, not just pagename. if there’s no page name variable, the URL is captured. if a page doesn’t have a site section or page type, i make sure they are set to ‘undefined’. this will make sure entries, time spent and pathing are not totally broken. Kevin – Great suggestion on the Search Results page numbering. Just to be clear, this DOES NOT mean putting the # of search results found in the page name which is a big mistake many clients make. All – I have received a few e-mails asking about using SAINT classifications to create friendly page names. I DO NOT recommend this. It is a quick fix, but creates a ton of maintenance and you lose all Pathing capabilities on friendly names. Don’t fall for this trap! Hi Adam – Is there any reason you use “:” to separate the sections within the page name? We use “|” but I see most people use “:”. Which character you use doesn’t matter. There was a time when the sitecatalyst search box had issues with the “pipe” so I got in the habit of using the “colon.”. Some people also like to add spaces after the delimited but I tend not to so as to avoid any search box issues (since space is a valid sitecatalyst delimiter. Do you have any thoughts on a page naming convention for user generated content? For example, my website is a “community” which allows users to to post discussions, replies to discussions, documents and to create groups. We pull in the URL into the s.pagename and one positive is that we can find new documents and groups that were created in a given time period. But the downside is SiteCatalyst can report several different pagenames (due to various reasons) which are the same page. Amazing post. I’ve read you for awhile and truly appreciate the time that you put into each entry. Keep up the awesome work. Do you recommend tracking each and every page in the site even if they are .jsp pages that aren’t visible to a user? We’re using SiteCatalyst for a web app in our company and, for example, we have a page called check_for_new_as_of_date.jsp (there are over 30 pages kinda like this). This is a behind the scenes thing that the app needs, not a page I care about from a usage perspective. We’re inserting the tracking code dynamically and we’re considering implementing some kind of list of excluded pages that would not have SC code inserted into them. The other option seems to be track every single page and use the filtering features in SC but that doesn’t seem like the proper use of those features. I’d really appreciate any thoughts/recommendations you have on these approaches. Thanks, Adam. That’s a really good idea. I really don’t want to track anything about these pages – it would fine with me if they didn’t exist. They exist for purely for technical reasons and only the app cares about them. My developers are unsure about whether or not maintaining a list of them and using some kind of logic to determine whether or not to insert SiteCatalyst code is an appropriate approach. Can I infer from your suggestion that this kind of programatic approach wouldn’t be something you’d recommend? No problem, Adam. I really appreciate your suggestion. I know I’m 6 years late to the post, but I’m having some issues with mixed case in s.pageName but I can’t find where I can convert it to lowercase. You mention a JS file, but I’m not sure where exactly you’re talking about. Thanks! where “page_name” is the string that contains the page’s name. Thanks, but that’s sort of my question. You say “find the section in the code” but I am not sure where “the code” lives. I understand code, I just can’t find the file where Adobe sets s.pageName. Where would I look for that? We’re using s_code, I believe. There’s actually a Tealium layer in between. When I go into Tealium and look at the template included for SiteCatalyst, there’s no mention in there of actually setting s.pageName. It references it to set OTHER stuff, but I can’t find where it actually sets s.pageName. If you’re using Tealium, wouldn’t it work to just use their lower-case functionality/extension? This a really helpfull post. I have a page which could be reached by two different paths. The breadcrumbs change according to the paths followed. In this case what is the best practice to create the pageName ?